Demographic segmentation: uses common customer characteristics to segment customers based on variables such as age, gender, life stage etc. Geographic segmentation: uses customers' location to segment customers based on country, state, city, etc. Behavioral segmentation: uses customer purchase data to segment customers based on their activity at your store such as last purchase data, etc. Marsello uses behavioral segmentation to help retailers identify their most valuable customers and develop effective marketing strategies through the use of RFM Analysis. Every customer database is diverse. It's made up of lots of different customers that all have different purchasing behaviors with your store. Segmentation allows retailers to send the right message at the right time, to the right set of customers. Understand your business better: know who your best customers are, who is about to slip away and better identify opportunities for growth. Improve customer loyalty: identify your loyal and best customers, and continue to grow these relationships. Identify your repeat customers – these customers have the potential to turn into loyal customers. Ensure their experience with your store is positive and memorable, then following up with timely emails and promotions will grow your relationship and encourage them to shop again. Improve your email marketing: send targeted emails to specific segments and get better results. Customers are more likely to engage with targeted emails, increasing open rates and click-through rates, and resulting in decreased negative reactions to your emails; this, in turn, increases conversion. Minimize marketing costs and improve ROI: identify valuable customers and focus their marketing efforts. Un-targeted marketing campaigns can be costly and ineffective. Identifying key customer segments and using their data to create relevant and targeted campaigns will reduce costs and increase conversion. Using RFM, customers can be organised into a segment. These segments range from 'Best' customers (very loyal and huge fans of your store) to 'Lost' customers (unlikely to purchase with you again). The great news is Marsello segments your customer database automatically for you. 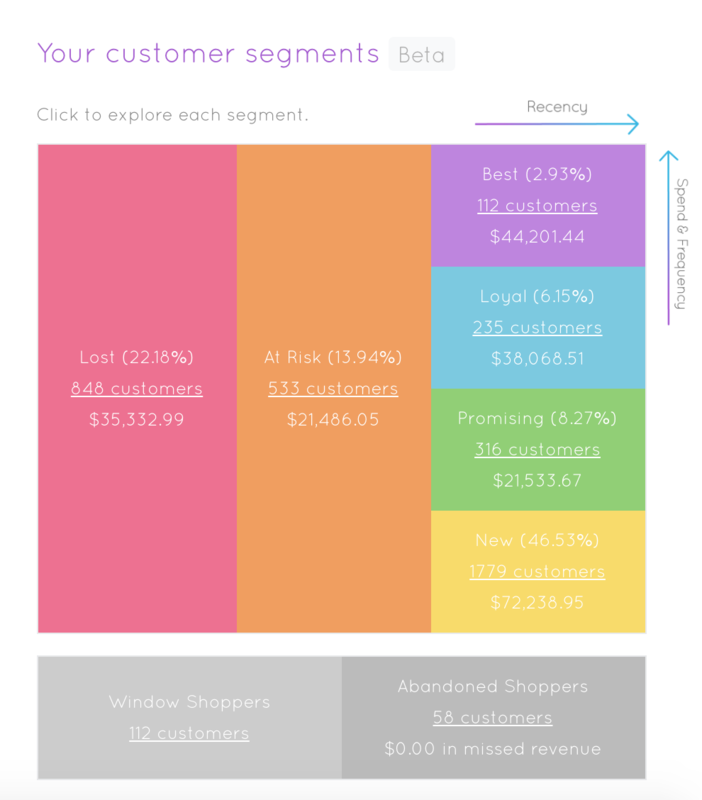 On your Home page, you'll see your customer segmentation grid and can see the distribution of your customer database across the 6 customer segments. Best: ordered recently, ordered the most often and spent the most! Loyal: ordered recently, ordered often, spent good money. Promising: ordered recently, ordered more than once and spent an average amount. New: made their first order recently. At risk: haven't ordered recently. Lost: haven't ordered in a very long time. 📝 Note: These segments are mutually exclusive, meaning that each customer can only be in one segment at one time. Window Shoppers: has a store account and has never made an order. By clicking on a particular segment's Customer total, you can see a list of all of your customers within that segment. % of Customers: the % of your customer database in that particular segment. # of Customers: how many customers are in that particular segment. Total revenue: how much revenue you've earned from this segment in the past year. Average Customer Lifetime Value (ACLV) of the segment: how much, on average, each customer in that segment is worth to your store, now and in the future. What's next? Marketing to your customer segments. Marsello has marketing suggestions specific to each customer segment. Simply click on your chosen segment to see suggestions on how to best market to these customers.